The neutron energy spectrum of 252Cf leaking out of the fabricated neutron source storage drum at the Philippine Nuclear Research Institute was simulated using MCNP5 particle transport code. The spectrum show highest contribution from 1 MeV neutrons and an increase in the thermal to slow neutrons. A boron trifluoride proportional detector with varying plexiglass (neutron moderator) thickness was utilized to provide benchmark data for the neutron counts leaking out of the drum. C. A. Dingle, F. Hila, N. R. Guillermo, J. F. Jecong, and P. Saligan†. 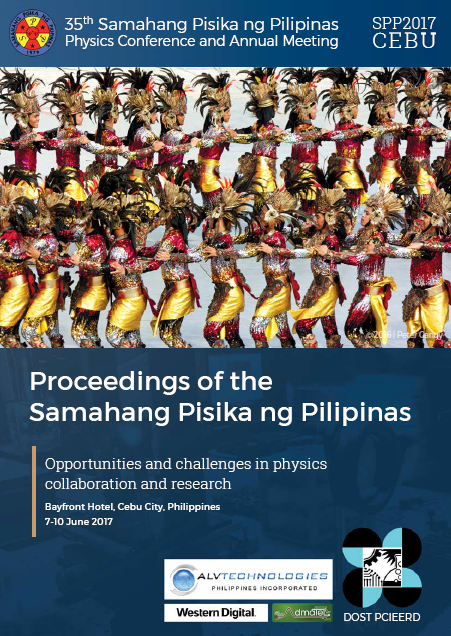 Characterization of 252-Cf neutron energy spectrum leaking in the neutron source storage drum using MCNP5, Proceedings of the Samahang Pisika ng Pilipinas 35, SPP-2017-2B-02 (2017). URL: https://paperview.spp-online.org/proceedings/article/view/169.